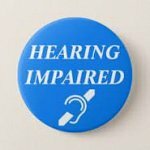 Are Adjustments for Hearing Impairment Adequate at Entertainment Venues? Emily Webster, a final year student at Sheffield Hallam, who has a genetic degenerative hearing impairment, doesn’t think so and is writing a dissertation and report to take to her MP. Can you help by completing her questionnaire and giving your views?